A week ago, friends were visiting from San Diego and we all went to dinner at St. Jack, a lovely French restaurant in SE Portland. What a meal. To start, pours of a Cremant du Bourgogne of some portion Aligote. Delicious, thirst quenching but more interesting than that. Salad Lyonaisse for me, full of tangy and smoky bacon. 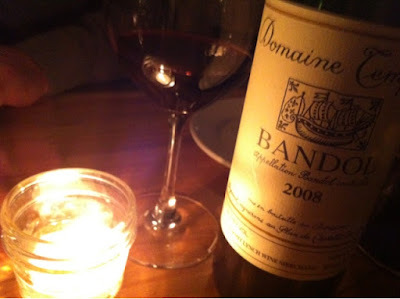 Then steak frites with '08 Domaine Tempier Bandol, showing well the modern turn of recent years in this cellar. Still, if I produced wine like this I would be more than thrilled. It's deep, aromatic, just hinting at what's to come in a few years as it softens. It's richly fruity, with a more purple color than I remember any Tempier wine from the '90s and earlier. And it's delicious, especially with good steak frites. Incidentally, St. Jack is also a cafe and patiessiere in one part of the restaurant each morning, with some of the best baked goods available in Portland. The canale alone are worth a long drive. Perhaps the best I've ever had. The bad picture doesn't do them justice. Trust me and go there if you are in town. After my last post about the dearth of serious Italian white wine, I of course thought of other examples I'd neglected. Take Soave for example. The best of this region near Verona may not be landmark wine like Mosel Riesling or White Burgundy. They are however worth noting. So there you are. This past weekend, we had friends over to watch the San Francisco 49ers crush (in my mind anyway) the Atlanta Falcons and earn a berth in the Super Bowl. I mentioned my post, without saying to a wine geek guest and mentioned Frascati as the white wine I'd tackle next. His telling comment? What about Orvieto? I guess he doesn't read the blog. Anyhow, his point was astute. Areas like Orvieto and Frascati (remember that in most of Europe wines are named for the region, not the grape), these are known only because of the vast amounts of swill they've produced, that is sold to charmed tourists and is ubiquitous on Italian restaurant lists in the heartland. You know, where there isn't much if any choice. The point is, Orvieto and Frascati have well earned bad reputations, because so much of the wine is lousy. And the point is, as I wrote about Orvieto, with a good importer or decent restaurateur or wine shop, you can find lovely if not life-changing Italian white wine for a song. I suppose that a big caveat - you do need to know a few things. But I think it's worth your time and will add to your meals and your life. So, Frascati. I first heard of the wine in 1989 when I was a student in London. A friend's father came to visit and we cooked fish and he bought Frascati. I believe it was in a fiasco, the squat bottle wrapped in straw that you know from Chianti and the unfortunate belief that they make good candle holders once the wine is gone. If not, it might as well have been. Fiasci are notorious for holding awful, touristy wine. And Frascati is at the head of the pack of notoriously bad Italian white wine. But as you might expect, not all Frascati is bad and certainly not all comes in a fiasco. (such a great word, the fiasco). 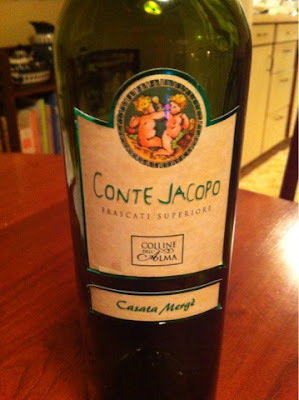 And wouldn't you know it, I picked up the 2011 Conte Jacopo Frascati Superiore to see how a seemingly trustworthy bottle would taste. Why trustworthy? 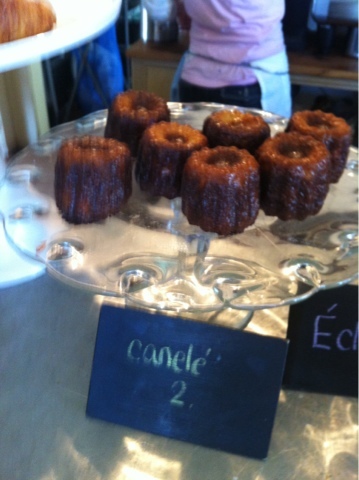 I bought it at a shop I trust, and the local Estelle Imports brings it in to Portland. They're great, so anything they bring in is at least worth a look. Sure enough, I loved this little wine. My wife found it a bit tart, but I would call it bracing. Think of it as the Muscadet of Italy, a zippy, minerally white wine for shellfish and, to finish things off tonight, a light pasta dish with pine nuts, ricotta salata and broccoli. The cheese is dried and salted ricotta, matching the briny sense in the wine. The lemony acidity washes the palate clean before the next bite of pasta, and repeat. Should one cellar this Frascati? No. It seems best as fresh as you can get it, and while the 2012 may be in town by the summer if not sooner, the 2011 is still perfectly lovely. Warm weather wine for sure, but in Portland's unusually cold (and dry) January, this is like a breath of summer. And the sea. The obvious dawned on me a few years ago with respect to Italian wine. For all the great Italian red wine, there's not so much Italian great white wine. It's almost weird, though I suppose Germany isn't exactly known for red wine. I'd just never really thought about it. There are the great Piedmontese reds of Barolo and Barbaresco. The Brunello and Chianti, of Tuscany, also reds. The Amarone of the Veneto. Even the noble. Aglianico of the south. All red. But whites? Not so much. Arneis is a modern white from Piedmont, but it's made in small quantities. And I understand its really only been bottled on its own in very recent times. It's a lovely starter to a Piedmontese dinner though I wouldn't imagine sticking with it too long when the food gets more serious. Yes, there's Friulano of the northeast. Delicious. Of course the great sparkling wines of Fanciacorta. Ok, that's great Italian white wine. And sure, the esoteric but occasionally brilliant yellow (intentionally oxidized white) wines of Fruili near the Slovenian border - Radikon and friends - can be magical. Not to mention the occasionally incredible Trebbiano d'Abruzzo like the Valentini I wrote about recently. But exceptions prove the rule. When it comes to Italian whites, you're mostly looking at things from touristy areas like the Vernaccia di San Gimignano in Tuscany or the Frascati from just outside Rome. The south has some interesting things like Lacryma di Christo del Vesuvio, but they're mostly after thoughts in the world of wine. Some of the best examples are overlooked gems. Are most great wines? Reference point wines capable of aging and improving with time like the best reds? No, not really. That strikes me as a little weird. I guess it's part of learning about wine, even when you think you know a few things. Italian whites can be and so often are delicious. They just don't capture the imagination like the great reds of Italy. They certainly haven't made the name of Italian wine, not even close. So what do we do with them? Drink them, because Italy is full of inexpensive, tasty whites mostly from grapes the world hasn't ever heard of. But with a little knowledge and perhaps some experience visiting the regions these little wines come from, you'll never think twice in an Italian restaurant about what to order. Take Orvieto. Sure, there's innocuous wine produced in the region, but what region doesn't have that? In most decent restaurants, as well as good wine shops, Orvieto is a great DOC (region) to look for if you want authentic taste at a very reasonable price. Many cost around $10-$15 in shops, so they'll often be served by the glass or listed near the top (cheap zone) of a wine list. Best of all, you're not getting the same grapes grown all over the world. You're getting something authentically Italian. Producer is important, though so is importer here in the states. Have some favorite Italian reds? Find who imports them and see if they import an Orvieto. That's a great way to start finding good wines in any region you don't know well. The importer will often have done the hard work for you, selecting something worth your time above many other offerings in the region. 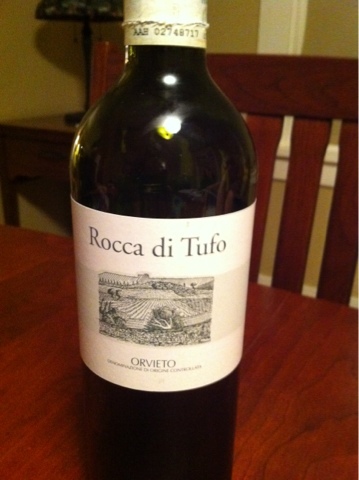 Take the 2011 Rocca di Tufo Orvieto. I didn't recognize the importer in this case - WorldWide Cellars Imports - but one of my favorite local shops in Portland, Storyteller Wine Company, had the wine on the shelf. That's another great (though maybe more obvious) way to find new wines. Try something you don't know from a shop you know and trust. In this case, the method worked and the wine was just what I was hoping for. Nothing fancy, nothing great, but for $12 or so, this was a lemony, yellow fruited wine with a slight mineral edge, just round enough to enjoy on its own and crisp enough to stand up to food. I can't honestly say if the wine was typical of the grapes involved - Procanico and Grechetto - but it reminded me of other nice Orvieto wines I've had in the past. The flavors were fresh and bright, with a seashell edge that maybe comes from limestone in the area that worked with a variety of foods over several days. And that's another secret - this wine lasted for a week in the fridge, a glass at a time in a screwcapped bottle, with no gassing or fancy vacuum stoppers to keep it fresh. It stayed lovely the whole time, something I find is true of many white wines, Italian whites included. People who just want a glass here or there, take note. Maybe it's due to the cold temps in our fridges, maybe it's the generally higher acidity of white wines, I'm not sure. I do know that some reds will last well for a few days on the counter, but whites, they can last and last. I got so excited about this wine I bought a few other Italian whites to try in the coming weeks. Next, a Frascati. Don't laugh, because this not well thought of region can deliver its own lovely little wine for next to no money, no matter its lowly reputation as a touristy wine that had a few years of minor fame decades ago. Italian white wine. It isn't fancy, but if you're adventurous, don't miss out. I was lucky enough to grow up by the sea in Los Angeles and spend much of my adolescence, in the water. At sea level. It was only years later after I'd moved away that I realized what sea level really means to me. I was sitting on the shore of an island in the Puget Sound, surprised I could see the whole of Mt. Rainier, all the way to its peak nearly three miles in the sky. You don't get to see the whole of a mountain very often. But here I was at sea level, and the thought struck me that there isn't really another place where I can see things, even the largest things, with such clarity. And I thought of growing up, being in the sea, floating on the water on a surfboard, waiting, which surfing is so much about. It gives you time to think, time to try to see things more clearly. In the end, the thought wasn't so literal. I live in Portland, essentially at sea level, but that's not what this is about. These days, I can find myself at sea level in many places - the vineyard and winery among them. Maybe it's with a person. But there's no place for me like the ocean where I grew up. On a recent visit to LA I took my usual trips down to the water, into the water, where everything slows down for me. Complicated things, surprises, make more sense here. I always want to stay longer than I can and I promise myself I'll return sooner than I might. It had been a year and a half since the last visit, too long. Maybe it was the influence of all that, but I did manage some new clarity on the wine front this past visit. My wine loving friend of the Valentini Trebbiano and Chave Hermitage Blanc gifted me a pair of California bottles he said I had to try, wines that don't taste like so much of what's made California's reputation in recent years. I'd heard a lot about both producers, Anthill Farms and Arnot-Roberts, but hadn't had the chance to try either. Wow, sometimes things really do live up to the hype. First, the 2010 Anthill Farms Pinot Noir Campbell Ranch Sonoma Coast. This is Pinot noir more in common with Oregon than most of what I know of California. The wine was medium ruby in color with an expressive aroma of cranberry, raspberry, light toast, old wood, all pleasantly herbal and very Pinot. The flavors followed, with piquant cranberry and raspberry notes, green peppercorn, earthy and savory with a worsted tannin texture and bright acidity, quite good if needing time to become more complex. The wine did seem a touch fizzy but showed no real unclean flavors, definitely a little sauvage tasting though. California Pinot really worth paying attention to. I'm the last to find out, but still, it's clear to me now. A few nights later we opened the 2011 Arnot-Roberts Syrah North Coast, listed at 12.9% alcohol by volume. What a beautiful crimson color with an incredible perfume of peppery green olive, raspberry and rose aromas, very complete and expressive. More of that nice worsted tannin texture, quite a bit of tannin but not too much, with lots of whole cluster herbal character, raspberry, mineral, old wood, lovely texture but needing time to resolve. This was delicious California Syrah, impressive without trying to be, if that makes sense. Again, wine that's transparent, that brings clarity. This is what California can really be about. I will admit it. Amid all the hype over Oregon's 2012 vintage, I've been more than a little nervous about the wines I made this past fall. Let me explain. In 2012, we had yet another cold, wet spring, which gets the growing season off to a slow start that very likely turns into a late, possibly rainy harvest. In 2010 and 2011 harvest dates were two to four weeks later than usual, meaning early October picking turned into late October, even November harvesting in 2011. If you know western Oregon, you don't plan outdoor activities that time of year. And yet, both years saw exceptionally dry and mild weather as long as we needed to harvest ripe, delicious fruit. We got lucky and the wines show it. After more cold and wet spring weather in 2012, it looked like we were in for another late harvest. Yet summer came on stronger than it has in years and by September we were maybe just a week behind "normal." We didn't have extreme heat. Instead, we had record dry weather and what seemed like perfect weather for growing grapes. Nice long days, cool nights, little disease pressure in the vineyards. Maybe it would have been nice to get some rain in there to water the vines a bit, but we had lots of ground water and the vineyard everywhere looked great. Then came the wind. Late September saw days that reminded me of warm winter days growing up in LA. Dry, warm winds not unlike a Santa Ana capped off our growing season. The only problem is, that kind of weather dries out the grapes, raising sugar levels and degrading acidity. What seemed like a really nice growing season suddenly seemed to be overheating at the end. Think of cooking a nice dinner, only to find your child has accidentally turned up the oven right before everything is perfectly done. Happily, the grapes came in healthy - in fact I've never seen such clean fruit. There were absolutely no rotten clusters or anything but some leaves to sort out before crushing and fermenting the fruit. I was just a little worried that sugar levels were a bit high, meaning higher alcohol levels that I'm looking for. And the flavors in the new wines were so fruity. Maybe even a bit frooty, if you know what I mean. Wine is a cured product, meaning we age it in barrels to allow it to change from something raw to something refined, naturally so. Think of fatty meats or cheese, to which age brings a depth and nuance that only time can give. Let's just say, as lovely as the fruit looked coming into the winery and as well as the fermentations went, I put the new wines in barrel with a lot of hope that the curing process of barrel aging would take jarringly raw, frooty wine and give the lace and elegance I look for in finished wine. The new wines aren't finished yet - they still have a long way to go in barrel. But tasting them today with a friend, I can finally say it - I'm excited. The Chardonnay is green tinted with aromas and flavors of green apple, pear and pineapple. I'm really excited about my first commercial white wine. Then a variety of Pinots from Armstrong vineyard. The 115 clone had a bit of whole clusters in the otherwise destemmed fruit and was picked a few days before the rest of the vineyard. This wine seems dense but gaining elegance, with good length. The Pommard, with a bit of 667 clone co-fermented, is earthy and a touch reduced. And the pure 667 is the most snappy and taut, though these will all be larger, more generous wines than the past two vintages. Tasting a blend of these different vineyard blocks in the press wine gives a nice look at what blending should achieve. There's a dullness typically of press wine, but a broader range of flavors that really excited me. Next we moved on to the three Eola-Amity Hills vineyards that I work with. As with Armstrong vineyard, these wines are all Pinot noir. This is my first year working with Crowley Station, a mix of 114 and 115 clones, planted in the late 1990s on its own roots. Being new to me, I'm wondering if the wine will merit bottling on its own as a single vineyard. Today it tastes lovely, full and dense as the vintage has given but floral with an emerging delicacy, a pepperiness, that I'm excited to see evolve with more time in barrel. Next is Zenith vineyard, all Pommard clone and a bit tannic at this point, nicely so with a firmness that balances the fruit and suggests a long life in the cellar. Then there's the Bjornson vineyard, higher in the Eola Hills on very red soils, mostly Pommard clone with a bit of Wadenswil. All my 2012 reds are saturated in color, but this wine is jet black. I'm not looking for such color and during fermentation I punch down fermenters only a handful of times total. But that's the 2012 vintage, dark and rich, and this wine is a bit of a bruiser. Experience with this site suggests it will calm down with further aging, but what I'm looking for here I found - a sense of vinosity emerging so that the wine isn't all about primary fruit. Finally we tasted the press wine, a mix of the three Eola-Amity vineyards. A touch lighter in color than the others, given that press wine has more solids (extra cloudy after pressing) and all that matter strips out a bit of the density as the wine settles out. I like press wine for its almost leavening quality in wine, taking the denser free run juice and airing it out a bit. Note, this is just the opposite thing I learned as a wine geek, free run wine being delicate and press wine heavy and dense. Free run wine is what come out of the fermenter without pressing, and it's about 80% of one's yield. If wine can be burly and dense, and it very much can be, that's free run wine talking. The press wine is usually lower in acid and lighter in color, frankly more suited on its own for simply quaffing wine. But blended in judicious amounts, I really like its lifting effect in a finished wine. In all, these young 2012s are powerful and impressive wines. My only worries have been if they reflect the style I'm carving out, of more delicate though no less flavory and delicious wine. What I'm seeing even after a few months in barrel is a positive lightening of the wines, so they lift and fly a bit in your mouth, not plod and thud in a graceless way. And after tasting through things today, I can finally say I'm excited that the power these wines will be known for will continue to develop more and more nuance and grace with more barrel time. Note, I use older barrels so these wines are not and will not become very oak marked. And these wines are in various stages of malolactic fermentation, meaning my impressions are snapshots, and certainly impressions that will continue to change. The important part, and why I've written all this, is that the wines are finally being wine-like, vinuous. And I'm simply thrilled about that. I really wish you could taste what I'm talking about, but perhaps in time.